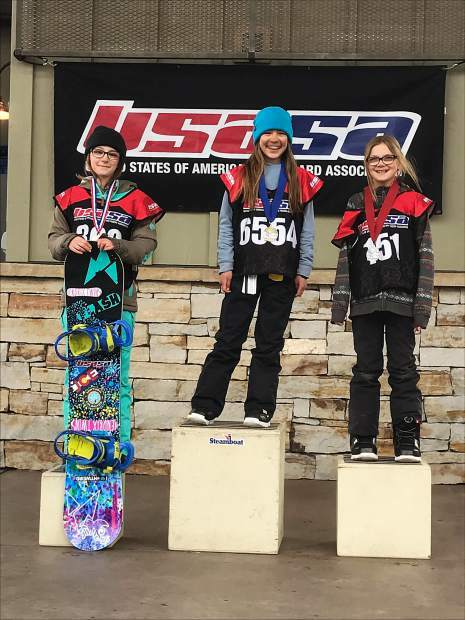 Team Summit snowboarders swept the podium at the Howelsen Hill rail jam on Feb. 18 in Steamboat Springs (from left): Devin Hendrix, Jadyn Dalrymple and Alina Cospolich. It was a weekend for the record books in Durango. From Feb. 18-19, the Summit Nordic Ski Club brought dozens of athletes to Durango for the final Rocky Mountain Junior National qualifier of the season. After a 10K classic mass start on Saturday and 5K skate interval start on Sunday (with varying distances for different age divisions), the local club had earned a whopping nine first-place finishes, followed by four for Steamboat Springs, three for Vail, two for Durango and two for Boulder clubs. Below are select results from SNSC athletes. For complete results, see the Durango qualifiers page at 4cornerstiming.com. This past weekend at the Surefoot International FIS series at Winter Park, Team Summit’s Kayo Denda (JPN) placed second overall for super-G in a very strong field of collegiate and regional competitors, according to head coach Troy Watts. Denda is currently the No. 1-ranked female super-G skier in her home country and is targeting a spot on her nation’s team for the 2018 Winter Olympics in PyeongChang, South Korea. A snowboard rail jam as part of the USA Ski and Snowboard Association’s Rocky Mountain Series, held at Howelsen Hill in Steamboat Springs on Feb. 18. The Team Summit girls swept the 10-13 age division for the first time this season. The following are select results from Team Summit only. A snowboard halfpipe contest as part of the USASA Rocky Mountain Series, held at Steamboat Springs on Feb. 19. A day after the rail jam sweep, the Team Summit girls again crowded the podium for the Menehune (10-11 years) division. A freeski moguls event as part of the USASA Rocky Mountain Division series, held at Telluride on Feb. 19. The following are top Team Summit results only. An age-group freeski moguls event, hosted by Steamboat Springs on Feb. 19. The following are Team Summit results only. A four-day series of races to qualify for the USASA Rocky/Central Division Championships in March. The events were split between giant slalom at Eldora and slalom at Loveland. The following are Team Summit qualified athletes only. A day of SYNC Cup giant slalom qualifiers, held at Eldora on Feb. 16.